Intex have had a rather busy month. The Indian consumer electronics manufacturer launched an array of devices of late including the Intex Cloud X3, Cloud Y2, Aqua i4 and the Cloud Y5. That is seriously a lot of phones for a very short span of time (about a week!). Coming back to the Cloud X4, the device comes with specifications similar to the X3, but with a few enhancements here and there. Let us talk about the full specifications of the device. The Cloud X4 gets a 3.2MP rear main unit, which is bumped up from a 2MP one on the Cloud X3. You will be a happy buyer if you have limited expectations with this unit, since a device priced as low as this one can really not be compared to other devices from international manufacturers that cost more than double the price of this one. The front of this device houses a VGA unit just like the Cloud X3, and again, the camera should be OK if you don’t expect miracles. The fact that the X4 comes with 3G support would mean that the front unit is used much more as compared to the X3 which does not feature 3G support. The Cloud X4 gets 512MB of ROM, that is internal storage, which is about the average for a device like this one. As always, there is a microSD slot that can be used to expand storage up to 32GB so storage shouldn’t really be a problem on the Cloud X4. We also don’t foresee many users using this phone as their primary multimedia device, so it’ll be surprising if you fall short of storage on this one. The device comes with the same dual core processor as seen on the Cloud X3. It is a 1GHz dual core processor we’re talking about, and it comes from none other than Mediatek. The MT6572 used on this device, comes with 2 1GHz cores based on the Cortex A7 platform. This makes a pretty decent processor for a budget device, and the you should be able to run most modern day apps on the device albeit with a little lag here and there. The phone is powered by a 1500mAh battery which again, is just about the average for device sitting somewhere between entry-level and mid range. The phone should go through one work day without hassles, when used moderately. However, heavy usage might cause the battery to drain much faster. The Cloud X4 comes with the same 3.5 inch 320 x 480p display as seen on the Cloud X3. Although it is not the best resolution in the market today, it does sound pretty usable for a budget device. We don’t expect users to do much gaming or watch many movies on this device, so it should be okay. The primary use such a display would find would be reading, be it during web browsing or chatting, or maybe even the occasional ebook. As most of our readers might be aware of, we’re surprised by the sudden interest in budget dual core devices shown by domestic manufacturers. This means that the Cloud X4 will have an array of devices to compete with, which includes but is not limited to Videocon A24, Lava 3G 356, Lava 3G 402, etc. However, the Cloud X4 comes with 256MB of RAM whereas a few other manufacturers have launched phones with 512MB of RAM, which makes the phone much more usable as far as multitasking is concerned. This includes the Campus A20 from Celkon. 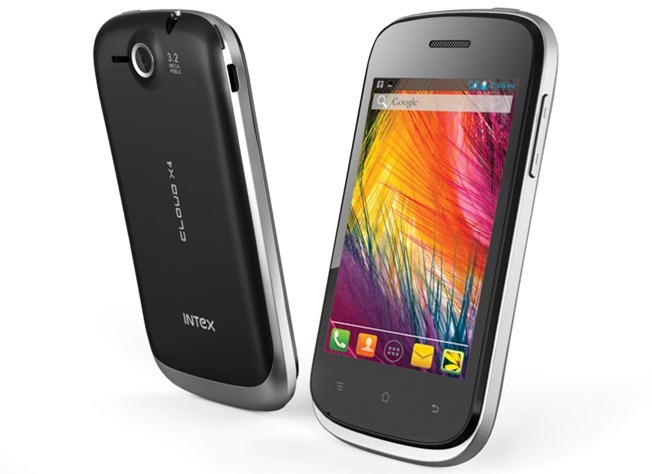 The Intex Cloud X4 comes with a more than decent specs sheet, considering the device is available for about 4.5k INR. The fact that it comes 3G enabled makes it even more worthy of the price, and the presence of Android v4.2 acts like the cherry on the cake. We would definitely give this new phone from Intex a thumbs up, and anyone looking for their first Android might not have to look further.